Dr BR Ambedkar had in men's contribution in the shaping of modern India. he LED millions of oppressed, to a life of self-respect, dignity and responsibility. Baba Saheb, as he was also known as, always stress the importance of better education, so that position of common people in society can be improved. It was he, who was primarily responsible for the formation of constitution, adopted after India became independent. Baba Saheb began the revival of Buddhism in India that has grown tremendously after his death and continues to grow today among his countless followers. He was a veritable phenomenon of 20th century. Dr Bhimrao Ramji Ambedkar, was chiefly responsible for drafting of the Constitution of India. Was the first law minister of India. On the 14th October, 1956, Babasaheb Ambedkar embraced Buddhism. He continued the crusade for social Revolution until the end of his life on the 6 December 1956.He was honoured with the highest national honour, ‘Bharat Ratna’ in April 1990. Dr BR Ambedkar was affectionately called Baba Saheb Ambedkar. Dr Bhimrao Ambedkar was born on 14th April 1891 in the British founded town and military cantonment of Mhow in the central Province presidency in the Indian states of Madhya Pradesh. He was the 14th child of Ramji Maloji Sakpal and bhimabai Ambedkar.His family was Marathi background from the town of Ambavade in the Ratnagiri district of modern city Maharashtra.Dr Ambedkar belong to the ‘untouchable’ Mahar caste. His father and grandfather served in the British army. In those days, the government ensured that all the army personnel and their children were educated and ran special schools for this purpose. This ensured good education for Bhim Rao Ambedkar, which would have otherwise been denied to him by virtue of his cast. Bhim Rao Ambedkar experienced caste discrimination right from the childhood. In 1907, BR Ambedkar passed the matriculation examination and entered the University of Bombay.He became one of the first persons of untouchable origin to enter college in India. The Gaikwad ruler of Vadodara awarded him a scholarship and he studied at the universities in the United States, Britain, and Germany. He plunged himself in studies and attained a degree in Master of Arts and Doctorate in Philosophy from the Columbia University in 1916. By 1923 seat completed thesis on ‘The Problem of Rupee’. He was awarded DSc by University of London and finishing his law studies, he was simultaneously admitted to British bar as a Barrister. The Canvas of Ambedkar's writing are was and the issues discussed by him in his writings are a modest attempt to Mirror to the prevailing issues of the Indian society. Ambedkar in intellectual analysis and insights provide a valuable resources to the students and researchers as well as tools engaged in policy making. Ambedkar through his writings has mould opinion in the minds of several Indians.Has brought about a Revolution among the Indian society by expressing his view on caste inequality, women empowerment and other social political issues. His major writings on the caste is ‘Annihilation of Caste’. 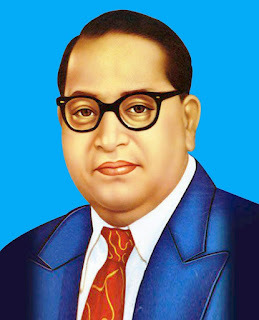 Baba Saheb Ambedkar play a vital role in framing the Constitution. He was the chairperson of the drafting committee. The greatest contribution of Dr Ambedkar was in respect of Fundamental Rights and Directive Principle of State Policy enshrined in the constitution of India. The Fundamental Right provide for freedom, equality and abolition of untouchability and remedies to ensure the enforcement of right (article 32). The Directive principles enshrine the broad guiding principles for securing fair distribution of wealth and better living conditions.